Was blind, but now I see.” That is my story, my testimony of how I came to know God through Christ Jesus. If Jesus is your Lord and Saviour, you too have a testimony. Have you ever shared your testimony? It is your personal experience of conversion. Conversion is the process by which we become Christians. We were all conceived in our mother’s womb and born after 9 months, give or take a week. We all came into the world as helpless babies, and grew to be the people we are today. The circumstances of our birth, the time, place and name we were given are unique. But we all came into the world in the same way. The same is true spiritually. Conversion is about our second birth, being born again. Our testimonies are unique, but God’s desire is that through giving our testimony others will be born again also. There are many biblical analogies for conversion. Born of the Spirit, baptised in the spirit, lost and found, raised from the dead, the blind able to see. This morning we want to explore the Apostle Saul’s testimony as told by Luke in Acts 9. There are three parts to his testimony. Before, during and after, just as there are for ours. One thing to say is Saul did not become Paul. Saul is Hebrew, Paul is Greek. He was always Saul and Paul, before, during and after he met Jesus. Saul was from a wealthy influential family of Tarsus. His father was a Pharisee, and Saul was trained as one also. Saul had been taught by Gamaliel one of the most famous Hebrew scholars. Saul could therefore speak Hebrew, Greek and Aramaic. He would have memorised most of the Old Testament. He was also a member of the Sanhedrin, the elite ruling authority of Judaism. He therefore had good connections, access to the high priest. Saul was also a Roman citizen, which meant he was part of the upper class. Raised in Tarsus meant he had access to what was one of the three most important universities competing with Athens and Alexandria. Saul had the best possible education, a combination of Greek culture, Hebrew religion and Roman law. Saul’s pedigree. I believe without a doubt that this is God’s word. One reason is because of the complete honesty of its human authors not to hide anything under the carpet. By the time this was written Saul was a celebrity, the hero of the church. But Luke does not disguise or play down Saul’s past. In Galatians 1:14 Saul admits that before he met Jesus he was extremely zealous for the traditions of his fathers. In that zeal, he had developed an all consuming fanatical hatred for the sect known as Christians. In Acts 26:10 he admits that “on the authority of the chief priests I put many of the saints in prison, and when they were put to death I cast my vote against them.” Quite a combination, a man of power and influence and a man with an all consuming passion to destroy the followers of Jesus. Saul’s Pedigree, Saul’s Prejudice. Not content to persecute the disciples in Jerusalem, he was prepared to travel the 140 miles to Damascus in search of Christians. That was a long way in those days, especially on foot. Saul’s Pedigree : he was an exceptional man of learning. Saul’s Prejudice : he was a fanatic, consumed by hatred of his opponents. Saul’s Plan : the systematic extermination of Christians. Saul was not the kind of person you would want to meet outside church one night…. From those few verses we learn a lot about the kind of person Saul was like before he met Jesus. The story also tells us a lot about God. God’s patience, God’s perseverance, God’s sovereignty. God had a plan for Saul, but the early Christians didn’t know it. They couldn’t understand why the Lord allowed them to suffer at Saul’s hands, but we know with hindsight the Lord was indeed at work. Gamaliel’s words in Acts 5:39 were quite prophetic when he said, “If this is from God you will not be able to stop these men, you will only find yourselves fighting against God.” If verses 1-2 tell us how God tolerates Saul so patiently. That was the first part of his testimony. Not persecuting Christians but “me”. God took Saul’s sin personally. The power of the risen Lord Jesus, revealed in the blinding light, brought Saul to his knees. The presence of the risen Lord Jesus through the voice that spoke brought Saul to his senses. Rather drastic you might think, but Saul was a dangerous man, a ruthless man. God uses the minimum force necessary to bring a person to the point of repentance and forgiveness. No one is immune or impervious from God’s call. Saul was full of prejudice but he found that nothing can impede the Holy Spirit’s convicting work. Saul had evil plans but he found out that no one interferes with God’s church with impunity. 45 years ago I came face to face with the realisation that God was Sovereign, and that I had been running away from him. I could run away no longer. God tolerates the Saul in all of us so patiently. God takes the sin in us so personally. That’s why Christ came. Few individuals could fulfil such a mission, but in God’s timing Saul became that person. I wonder when the Lord began to sow the seeds of doubt in Saul’s mind. When the light and voice confronted him on the road to Damascus, Saul already knew who it was speaking to him. Saul says, “Who are you, Lord?” Saul was a chosen man. Saul was a changed man because of that meeting with Jesus. I’m glad that I haven’t been given the kind of assignment Ananias got! Is there anyone in our church you find it hard to get on with? How does Ananias greet Saul when they meet? He calls him “brother”. The next time you feel like giving up with a particular person you don’t like, remember how hard it would have been for the church at Damascus to accept Saul. 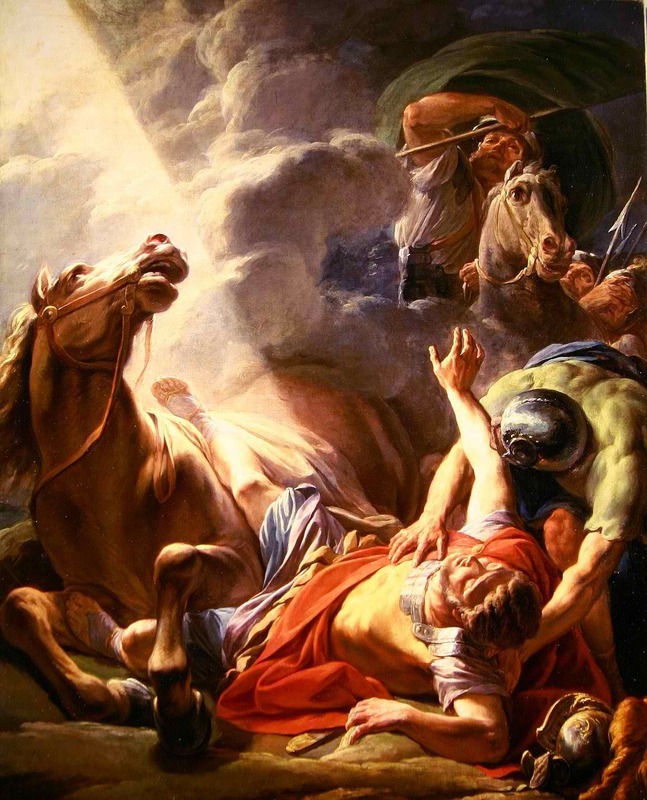 Only the Lord could transform Saul from a zealous persecutor of the church into one of its foremost missionaries. Now if you had been one of the apostles, say James or Peter, how would you have responded to Saul? Made him Principal of a theological college? The Bishop of Athens? That’s probably what we would do, but what did the Lord do? He took all Saul’s training in the scriptures and the law, his gifts of languages and culture, his key contacts from all over the world and what? We have here then Saul’s testimony. How did Saul’s life end? In retirement on Crete? with a church pension? With book offers from publishers for his autobiography? his own TV station? With churches named after him? We don’t know. God did not think it that important to ensure it was recorded. Tradition has it that Saul appealed to Nero and after two trials was executed in AD 68 on the Ostian Way outside Rome. Executed for the crime of being a follower of Jesus Christ. Saul is a model. A model of the way, God tolerates His Saul’s like you and I so patiently. How God takes our sin so personally, that’s why Jesus died in our place. How God transforms us so providentially. God is powerful enough to turn His enemies like Saul from blind religious fanaticism, into His friends. If He could do it for Saul, think what He can do in and through us. I began by sharing my testimony. We have looked briefly at Saul’s testimony. Now it is your turn. I want to help you think about your testimony. We have all been influenced as we have heard what God has done for others, like Saul. Then realise that by God’s grace, other people may be brought into the kingdom my your testimony. When you came in you should have received a paper ‘Your personal testimony’. Please take it out because I want to take you through it. May the Lord give you opportunities this week to share your testimony of what he has done and is doing in your life, because conversion is not a once for all event but a continuing process of becoming more and more like Jesus Christ every day.